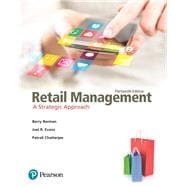 by Berman, Barry R.; Evans, Joel R.; Chatterjee, Patrali M.
Retail Management: A Strategic Approach is built on the fundamental principle that retailers have to plan for and adapt to a complex, changing environment. Without a pre-defined and well-integrated strategy, retailers may flounder and be unable to cope with the environment that surrounds them. This text helps readers become good retail planners and decision makers. The 13th Edition incorporates updated data that reflects the current world economic climate, extensive coverage of omnichannel retailing, and many new vignettes, questions, and cases, so that readers can thrive in today’s retailing industry.